Nokia Lumia 900 is a smartphone for fans of new technologies. This model gives you unlimited use of high-speed Internet. Its users will experience incredible speed thanks to a powerful Snapdragon processor with a frequency of 1.4 GHz. Moreover, the Nokia Lumia 900 is ideal for sharing your experiences on popular social networking sites such as Facebook and Twitter, and posts can instantly enrich the photos taken with the integrated camera 8Mpx with Carl Zeiss technology. Unique large ClearBlack AMOLED touchscreen with a diagonal 4.3-inch layer of protective glass works not for watching movies and photos, even in bright sunlight. The model is also equipped with two cameras, so you can conduct video calls and also to share with the caller view around us. 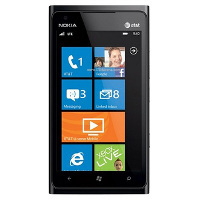 Nokia Lumia 900 is also interesting 100 000 applications available on the Marketplace. This model is the perfect companion for every day, and on the go. Nokia Maps will we navigate to your destination even in offline mode, and the size and quality of the screen make the Nokia Lumia 900 easily replaces traditional navigation. Nokia Music with Mix Radio app - allowing free play music with finished or customized to individual preferences music channels. Nokia Music also has a built-in application Concerts, with which you can search for music events in the area. Remember that entered PIN on the website must be exactly the same as PIN entered in the setup program on your Nokia Lumia 900.